Born Pretty sent me some of their nail products to check out and the first one I'll share with you is their Kelier Crack Polish in black. I used one coat over a red creme shade and it took approximately 3 minutes to "crack". It retained a high gloss finish, and it seemed to adhere well. I will mention that I tried it over a glitter polish initially, and the adhesion was not as good. It seems to works very well with creme and shimmer finishes though. I tried this polish over a couple of other shades and depending on your base polish, the crackle effect will vary in the pattern that emerges. Over creme shades, I always ended up with an evenly distributed pattern that was similar to what is shown. Over shimmer polishes, I ended up with a finer, more delicate crack pattern. Born Pretty offers 7 shades of their crack polishes, and they retail for $4.08 for one. The more you buy, the more you save. Born Pretty carries a wide variety of nail polishes, cosmetics, and nail art supplies. It appears that they accept PayPal, and there is a section on their website for discount coupon codes. Information of their shipping costs can be found here. *Product featured was furnished by Born Pretty Store for review. Oh, I'm SO glad I read this! I've been having trouble getting it to adhere, but I have been trying it over glitters. I'll have to try it over a creme! As much as I love crackle polishes, I'm not really a fan of how this one looks. There's not much of the base color peeking through. Glad I found this because I was thinking about trying out some of their crackle. Love this crackle effect. Can't wait till China Glaze comes out with there's. I also like this brand since there are different shades of crackle polish. Crackle polishes are so much fun! This is so hot!!! 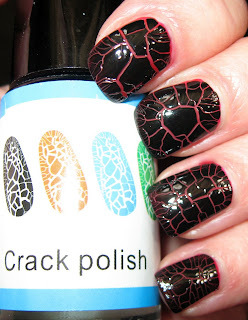 I have never seen crackle polish before.